This takes you to the analytics for social traffic. Click the Activity Stream tab below the charts. You see a list of posts and of people who have posted or commented on Google+ and also linked to your website. Check the list of posts from Google+ to find posts that mention your website. By default, you see ten posts at a time. Click the right and left arrows to move through the list and look for any good posts you might have missed. Click the little down arrow/triangle at the upper right of each post. Page Analytics provides analytics for that specific page on your website. 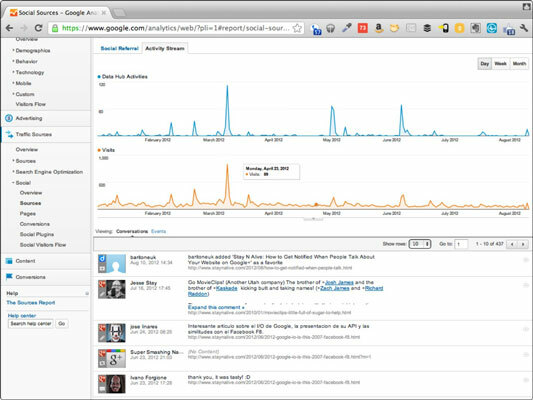 View Ripple shows the ripple of influence for that specific share on Google+. View Page takes you straight to the page on your website. View Activity takes you to the actual Google+ post. Spend some time absorbing what’s being said about your website. The activity stream is where the conversation is happening; it’s an extension of the comments already on your website. It’s your audience and your community. You can go through each post linking to your website and click the +1 button on the post. This shows your acknowledgement of their share of your content. Occasionally, you might also participate in the conversation, which will then send future comments to your Google+ notifications so you can follow the ensuing conversation. Sometimes a simple thank-you will suffice to turn on notifications for that particular post. You can get notifications of every new mention of your website on Google+ by creating an e-mail notification for this report. Just go to your Activity Stream tab and click Email.